Pretty much everyone acknowledges that Netgear’s Arlo system is one of the best true wireless home security camera systems on the planet. So why doesn’t everyone use Arlo? Simple: Arlo cameras are really expensive. Whether you already have a system and want to expand or you plan to buy one and start building it out, today is definitely the day to pull the trigger. Why? 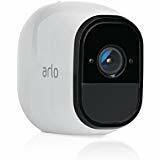 Because Amazon has Arlo Pro by NETGEAR Add-on Security Camera refurbs in stock for just $119.99 each. That’s the lowest price we’ve seen in at least 6 months, and it’s a big discount compared to the $190 retail price.